A large percentage of the population is affected by scars. They may be the result of an injury, surgery, burn, or acne. Each year, an estimated 100 million people develop scarring as the result of an operation. No matter what a scar's cause, Mederma is a popular brand for treating scars and is designed to reduce their appearance as well as soften and smooth the skin. Mederma Advanced Scar Gel is a product that has been rated the number one scar treatment product by pharmacists, according to U.S. News and World Reports. This non-greasy formula is designed to fade both new and old scars through consistent use. According to Mederma, the product has been clinically "shown to improve the color, texture, and overall appearance of scars." This skin care product is made up of ingredients that focus on hydration and reducing inflammation. That includes botanical extracts, such as leaf and onion extract, and Cepalin. The latter is unique to Mederma products and is used not only to treat inflammation but to prevent an overproduction of scar tissue. This combination of targeted ingredients can reduce the severity of scars as well as the overall appearance of the skin. Mederma Advanced Scar Gel is sold in tubes of 20 and 50 grams for about $12 for the smaller tube and under $30 for the larger tube. It generally takes eight weeks to see changes in new scars (less than a year old) and three to six months for older scars. Add a thin layer of Mederma gel to the scar and gently massage it into the skin. If the skin appears flaky, it is an indication that too much has been applied. Wash with soap and water and try again. Ideally, it should be used on clean, dry skin. This allows the gel to be properly absorbed, increasing its effectiveness. If other lotions, creams, or moisturizers have been applied, wait to use Mederma. Something else to keep in mind is that the product should never be used on open wounds. If stitches or a scab is present, do not begin treatment. It is possible to experience an adverse reaction. Like any other skin care item, it is important to do a test patch first. Apply a small amount of Mederma Advanced Scar Gel to your chest and wait 24-hours. If there are no symptoms (such as redness, itchy skin, or a rash) then it is safe to use. Mederma skin care products must be used correctly. Inconsistent use can slow down the healing process. If you are concerned that you may forget to apply the gel, set a daily alarm on your phone, or add a note to your online calendar. When it comes to the effectiveness of Mederma, there is no definitive answer. Numerous clinical studies have highlighted the benefits of onion extract on scars. A study on the ability of onion extract gel to improve the appearance of postsurgical scars, published in the Journal of Cosmetic Dermatology, for example, showed improvement in scars after four weeks of application. Another study, however, by Beth Israel Deaconness Medical Center, found there was no noteworthy difference between the extract and petroleum jelly. The Mederma website, however, references the strong track record of the product. It includes information from The Journal of Clinical and Aesthetic Dermatology. Test subjects saw a 36% improvement in the overall appearance of their scars after eight weeks of use. Mederma is also the number one doctor recommended brand for scars (for over 15 years) and the number one pharmacist recommended brand (for 14 years). User reviews of the product are mixed. Many have experienced noticeable results after a month or so of use. According to beauty review site Monica's Beauty, the gel smoothed out the skin and made scars less obvious. Additionally, review site Makeup Alley found that 70% of users would repurchase the product. Paula's Choice on the other hand, gave it a so-so review, citing inconsistent clinical studies. Like any skin care product on the shelves these days, there are pros and cons to using Mederma Advanced Scar Gel. They should be considered before making a purchase. The formula is water based, non-greasy, and has a pleasant scent. These factors make application a more enjoyable experience. Many people have noticeable before and after results. Mederma offers a full refund to anyone that is unhappy with the product. Some users have a sensitivity to the ingredients, which can lead to issues like redness, swelling, itching, or scar discoloration. The product must be used daily in order to see results. No scar treatment can completely remove scarring. 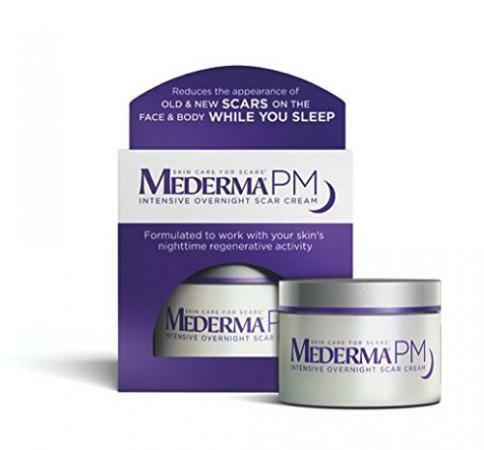 In addition to the popular gel, the brand also offers Mederma PM Intensive Overnight Scar Cream, which is applied before bed, and the Mederma Scar Cream Plus SPF 30, which is used to protect scarred skin from the sun. You can use either or both of these products to supplement the gel. Mederma is a highly regarded brand when it comes to scar reduction. Those who choose to use this over-the-counter treatment, however, should always seek the advice of a health care provider if skin irritation occurs or the scar worsens. With consistent application, the overall appearance of scarred areas may be improved.